Situated in a desirable area of Norwich, this single-storey home dates back to the 1970s and is one of several on the road built by the same developer. As this corner of the Golden Triangle is much sought-after, finding a home of any size to buy can take time and for those seeking a family property, it can be especially difficult. This bungalow was therefore bought by the client, knowing he wished to extend it. His hope was to be able to add two bedrooms and a bathroom – and, while doing so, to re-style the property, giving it something of a Scandinavian aesthetic. He was also very keen to create some workshop space and bring in some energy-efficient, eco features. These included adding a woodchip-burner as a heat source, as well a heat exchange system to make the most of ambient solar heat gain. 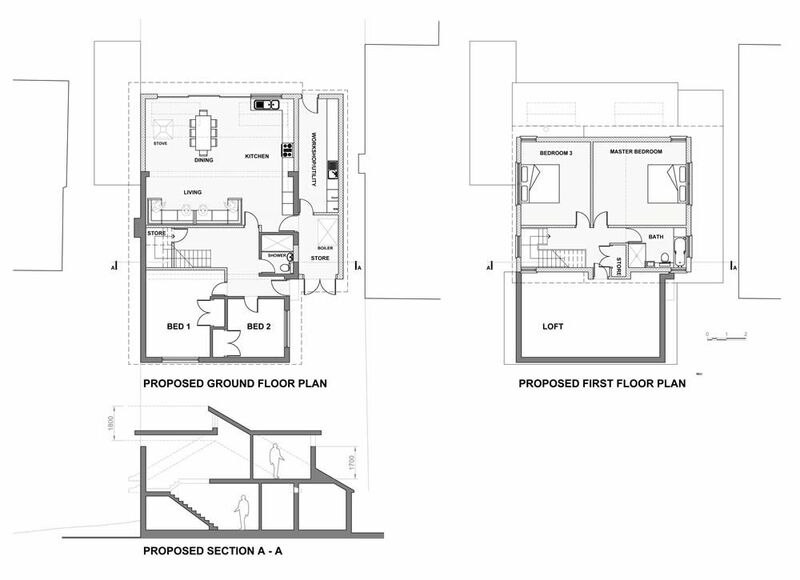 We discussed the various options for increasing the floor space of the bungalow and decided the best way forward was to consider extending upwards and outwards. One immediate issue was that all the neighbouring properties were also bungalows. I therefore decided the sensible route was to obtain pre-application planning advice to ensure an upward extension was acceptable in principle before we embarked too far along this path. I also had to solve the problem of where to locate the new stairs and to provide natural light without positioning windows so they overlooked neighbours. This project was not straight forward but I enjoyed the challenge of exploring the possibilities and the conclusion I came to was to try to soften the appearance of the new first floor. I achieved this by carefully positioning it towards the rear of the building so that from the road, the property would still present as a single-storey home. I also added dormers to the design and decided to bring in a split-pitch clerestorey, a high section of wall which accommodates windows above eye level in order to admit light. The pre-application advice we received was positive, with the comments principally focusing on protecting the neighbours’ privacy by considering the window design. I feel our plans addressed this well and my designs are now going through the formal planning consent process and we are awaiting the outcome, hopeful of a positive response.